MANILA, Philippines - Health and fitness bands have been a triathlete’s best friend from quite some time now. With these bands, triathletes can constantly monitor real-time health statistics as they go about their routine without the need to strap themselves onto some bulky equipment. But these bands are made just for training. A smartwatch, a more sophisticated wearable that is the current craze, can do the fitness band’s job and more. Smartwatch technology has proven to be truly liberating and empowering that triathletes, such as the members of Tri Six Fiv, never go out for a run without strapping on a smartwatch like the Samsung Gear S2. Five triathletes—namely, Xander Angeles, Dwan Abanto, Arvin Alvin, Denise Hernandez, and Nico Valdez—say that smartwatch technology has become indispensable in their training. Huddling together over a healthy breakfast, the Tri Six Fiv members marveled at how their training programs have benefited all thanks to wearables technology. 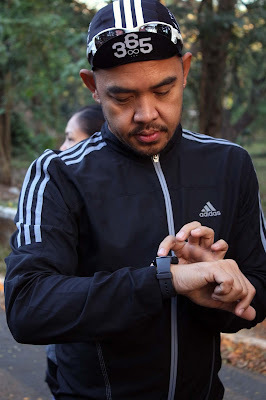 Xander Angeles sets up his Gear S2 before a run. Ace celebrity photographer and triathlete Xander Angeles relies heavily on his favorite app on the Samsung Gear S2—the heart rate monitor. “It’s very important to know the heart rate, since that dictates my pace. In the past, I had to stop what I was doing to check this, but now I know everything in real time—it’s truly liberating,” he says. Coach Dwan checks her Gear S2’s step counter. 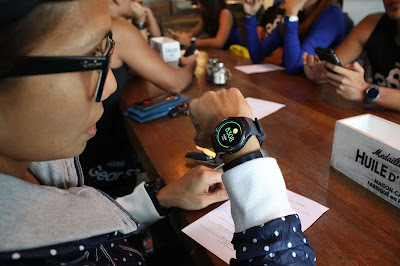 Fitness guru Dwan Abanto uses the Gear S2 in training clients. She has downloaded an app called the Workout Trainer on the smartphone to check the intensity of a given activity. “It’s like having your own personal trainer,” she enthuses. Among the pre-loaded apps, her favorites are the water and caffeine intake counter, which enable her to monitor her consumption which is very important to her health regimen. Like her fellow athletes, runner Denise Hernandez loves the Gear S2’s health monitoring functions, but her favorite feature is its ability to receiave messages even without holding onto the phone. ”I can never be disconnected even when I go out for runs, but it is downright inconvenient to carry a smartphone. With the Gear S2, I can keep in touch and be apprised of whatever is happening, allowing me peace of mind whenever I start training,” she says. Another Tri Six Fiv member Nico Valdes shares that he enjoys the way the Gear S2 seamlessly connects with his Samsung smartphone. “Pairing it with the phone allows you to enjoy more functions, which makes it even more fun to use. The Gear S2 has phone-like features, and it can even load photos. It’s unbelievably user-friendly and easy to navigate, especially with the rotating bezel that lets me tap into a wide assortment of apps. Even when I’m not training, I can use the Gear S2 to check and reply to messages. I can even wear it for other activities as it goes very well with casual wear. I really can’t find anything more versatile and useful than the Gear S2. For a triathlete, it’s a necessity,” he says. Engineered to suit the needs of active types, the Samsung Gear S2 smartwatch allows athletes and fitness enthusiasts to monitor important fitness and activity stats in real time even while off-training in a simple, convenient way. It has a powerful health tracker app, S Health, which monitors the most important stats such as heart rate and pulse rate as well as the user’s liquid intake, the number of calories burned, and the number of hours spent walking, running, sitting down, and curling up in bed. It even sends motivational messages to keep the user’s spirits up. Leveraging on Samsung’s expertise in wearable technology, the Gear S2 showcases a circular interface and rotating bezel which make navigation of apps easier, with a clear and bright, 1.2 sAmoled screen. It also has a superior music player that allows for browsing of albums and playlists and can store up to 300 songs on the watch. Built with a battery that lasts for 2-3 days, it guarantees less downtimes, and more hours on the go. Even more, the Gear S2 can withstand water up to 30 minutes in 1.5 meters of water due to its IP68 certification. The Gear S2 comes in two models: classic and sports with personalized and interchangeable watch faces and wrist straps for utmost versatility. With the Gear S2, triathletes have discovered an entirely new dimension in training, and it just gets better with every turn.